Question:The Dresses Can Customize ? Yes,Of Course,Can Customize and You give us measure size is better, Not Need pay for Extra Custom-made Cost.Sep1:Please choose a size and color order and payment,step2 By The Order Message Tell us the Measure size . Please! The Skirt need a petticoat ? Yes , the dresses Skirt need Petticoat , The order Not inculdding , but you can order from the Diandiai together , we will sent them to you together Usully How long arrived USA? Normal Order need 7-10 days for processing. Expedited Shipping need 2-4 Works days. Standard Shipping need 12-15 days. Quality Made-To-Order Dresses. Please find your proper size in our Size Chart, or provide us the following measurement for more fitted dresses. 3.We accept No Reason Return within 7 days. Thank you for your trust!!! 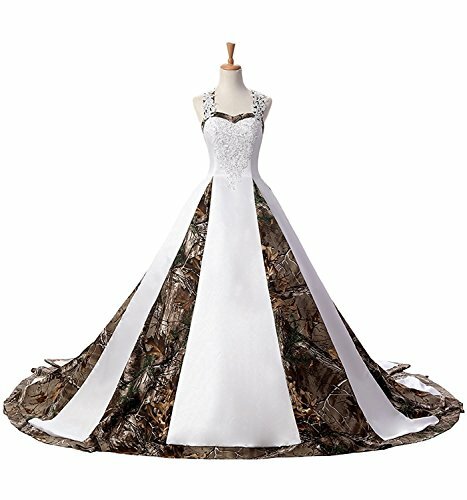 Fit for Camo Wedding Dress Vintage African Outdoor Fat Plus Size Wedding Evening Gown other Special Occasion Wear it to Get More Compliments! Accpet Customized Size .NOTICE: Before order, Please Carefully read the LEFT Size Chart Picture (Not the Amazon size chart) Dry Clean Suggested. Low iron if needed. If you have any questions about this product by ZVOCY, contact us by completing and submitting the form below. If you are looking for a specif part number, please include it with your message.